This 16-year-old songbird is stealing everyone’s hearts with her soulful tunes andrebellious, yet infectiously confident attitude. Who am I talking about? It’s the one and only Sabrina Carpenter who rocked the stage at this year’s YTV Beach Bash, showcasing her hit songs from her debut album Eyes Wide Open. Not only is Sabrina a super talented singer, she’s also quite the actress. Sabrina bagged her first role back in 2011 as a guest on the hit show Law and Order and is currently starring in the Disney series Girl Meets World. At such a young age, Sabrina manages to jungle her music and acting career with poise and confidence. We caught up with Sabrina Carpenter to chat about her musical influences, Eyes Wide Open and what it’s like working with Ben Savage and Danielle Fishel. When did you music start to influence your life? Sabrina: Honestly, from the time I started talking. I heard music all around me from childhood and I never really saw myself doing anything else other than making that my career. What was your favorite part of creating your new album Eyes Wide Open? Sabrina: Just the learning experience, because I think I learned a lot about myself while working on the album. It taught me a lot about music and writing. It was such a wonderful process to meet so many people that also have the same love for music, and just being able to make something special that would forever be my first child. Amongst the twelve songs on Eyes Wide Open, which song would you recommend to new listeners and why? Sabrina: I would probably recommend either “Too Young” or “Eyes Wide Open”. “Eyes wide Open” is the name of the album so it represents the album and kind of who I am as a person. And then “Too Young” was a song that I wrote and it’s just very simple, beautiful and honest and it obviously shows off the beginning of my writing process so I would definitely recommend those. As you progress in your career, do you find yourself experimenting with new musical sounds? Sabrina: All the time. I think it’s a bit of a struggle for me because I’m a fan of so many different types of music. When it comes to making your own music, you really have to stick to one or else you’ll confuse people. I’ve never really been like that; I’ve always just wanted to explore many different types of genres. I think that in my first album there are plenty of different genres and different ways you can see me, so it’s heard to try to be one thing. I love many different styles and I definitely have a lot of tricks up my sleeve. Who did you grow up listening too? Sabrina: I really grew into loving Christina Aguilera, Adele and The Beatles so there were a lot of different things around. My parents always encouraged me to try new things musically, so I sang a lot of bilingual songs just trying to expand my knowledge in all of music. 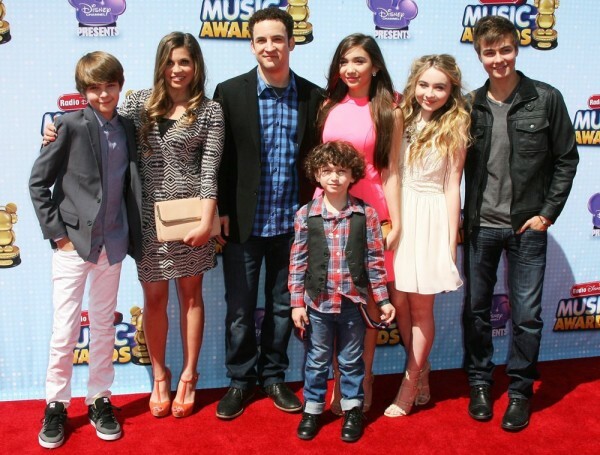 What was your reaction like when you first found out you landed the role as Maya Hart on Girl Meets World? Sabrina: It was over the moon! It definitely started something that has been nothing but one of the greatest experiences of my life. I screamed a lot while sitting in In n’ Out Burger. I couldn’t even eat dinner because I was excited so then I ended up at Menchies. Sabrina: I watched Boy Meets World on my own anyways and I really wanted to just because I thought it was super cool to be working with the original cast. I’m glad I watched it because there’s a lot of little jokes and throwbacks that I would have no clue about unless I watched Boy Meets World. The character of Maya was just something that I felt really comfortable with, so as soon as I started, I fell right into the role. Do you find similarities between Maya Hart and yourself? Sabrina: Definitely the sarcasm and the way that Maya goes through life- she is very confident. Obviously I think Maya is a little bit more rebellious than me, but we can all learn from Maya’s confidence and her friendship because she’s such an amazing friend. What is it like working with Ben Savage (Corey) and Danielle Fishel (Topanga)? Sabrina: They’re some of the best people I have ever met in my life. They constantly know how to make us laugh and smile and they’re such big influences on me. They’re just such positive people. They’re so humble and down to earth. You would think that after seven seasons, they would be a little cocky, but they’re really not. I love them very much. Tune into YTV to see the #YTVBeachBash on TV! It’ll be airing on August 16, 2015 at 8:30 EST.